The senior running back is the consensus top player at his position. Carlos Hyde is a big back, but is by no means a plodder. He has quick and nimble feet. Hyde can shuffle his lower body to squeeze through holes, or to elude defenders in the open field. His burst and power really stand out. He can barrel over would be tacklers, and make defensive backs miss at the second and third levels. In this class, Hyde is the one most likely become a foundation back. When Eddie Lacy went to Green Bay in the second round of last year’s draft, he instantly transformed their offense. Hyde can have a similar impact on his next team. Both Lacy and Hyde are strong power runners that have more quickness than you’d originally believe. Hyde would bring a sustaining and balancing effect to any team with a great passing game. If he went to a run heavy team, he could carry the load with ease. He’ll be the first back taken, and be a leading rusher for his team for many years. The character issues are one thing, but on talent alone, Isaiah Crowell absolutely belongs in the first tier. Just put on the tape. His play at Georgia was quite outstanding. Crowell is an aggressive and violent runner, who isn’t afraid to mix it up with bigger defenders. He does an incredible job of combining urgency and smoothness on the field. You will be hard pressed to find Crowell dancing. When he sees a hole he hits it, and hard. Crowell will have his share of mental gaffes, but he is clearly fast and talented. Crowell runs with the same violence and reckless abandon of the Seahawks Pro Bowl rusher. Crowell also has the quick and nimble feet of Marshawn Lynch. It’s what afford both of them the ability to change directions, and get down the field. Both players relish contact, and can absorb and dole out punishment. They are not just power backs, but explosive big play threats. If Crowell is a perfect citizen, he will be a starting running back, and a darn good one. In addition to physical talent, he shows all the advanced traits that lead to NFL success. He will be drafted much later than he should be, and it will be up to him to rise up a depth chart. The versatile senior running back is not particularly flashy or dynamic. But Charles Sims is my favorite back in this class. He is not fast or sudden, but he times his cuts well and creates needed space and makes people miss. He does take short choppy steps, so he could stand to become more fluid. Sims has a thick lower body, and keeps his legs churning to get extra yardage. His best attribute is his ability as a pass catcher. Sims has excellent spatial awareness, body control and hands. This is the most popular comparison, but it fits very well. Sims does not have Matt Forte’s size, or fluid movement. However, he is very similar as a pass catcher, and could have a similar impact at the pro level. Both players are very intelligent and bring great timing to the football field. Sims is another player with lead back potential. He won’t ever be dynamic, but can be build a strong, sustaining rushing attack. There are plenty of ways he can improve his game. Right off the bat, Sims’ NFL team will know it got some extra juice in the passing game. He wasn’t the best back on his own team, but James White is criminally underrated in this draft class. White knows when to change directions, and can make devastating cuts in the open field. He has nice vision in finding the crease, and knows when to go downhill. White has quick feet, and is very elusive in the open field. While he’s comfortable in traffic, he’ll never be mistaken as a power runner, and does need to add strength. He is a capable receiver, and a willing pass blocker. The former first round pick had a tough time getting on the field for the Panthers early on. His lack of bulk and power made him a limited player. When Williams added more versatility to his game, he earned playing time and showed off dynamic skills. White has the same cutting ability and elusiveness Williams posses. Much like Williams, James White might have a difficult time nailing down a full time role. Some team will draft him with the idea of adding a compliment to a strong starter. However, if White adds some power to his game, he might end up overtaking the incumbent back. If you want to be wowed, click on any Terrance West clip. Level of competition aside, West is a fun watch. He has the wiggle, balance and foot quickness many men his size lack. The Towson product can stop and start with ease, before slamming through an open lane. He looks great in between the tackles, but is perfectly capable of bouncing a run outside. West has strong vision, but could be a bit more patient on the field. The best part about West is he almost never goes down on first contact. The now retired Ravens’ and Browns’ running back put together a great career in his day. Much like Jamal Lewis, West is a powerful man, but has the balance and elusiveness to be more than just a between the tackles back. Lewis had the speed to get to the second level, and it was all over after that. West is very similar in that regard, and is a real chore to bring down. West might not be a starter right off the bat, but he can have an instant impact. If he earns snaps early, he could have a few nice games as a rookie. If West lands in a prime situation, he could be the best back in this class. He has really special potential, as long as the jump in competition isn’t too much. At the very worst, West will have a solid few year’s run as a starter. There is a ton to like about Devonta Freeman. He handles himself well in pass protection. He has good feet for it, but can get pushed around a bit. He’d be a nice third down back with his potential as a receiver as well. As a runner Freeman is pretty good too. He doesn’t mind a muddled backfield, and is quick in identifying where to run. He has a subtle first step, but can go too laterally at times. Freeman keeps his legs churning through contact, but isn’t really strong enough to finish the job. The young Patriots’ back has a very defined set of skills. Shane Vereen is a great pass receiver, and third down specialist. He is also a solid runner, but a bit inconsistent in this regard. When he’s been on the field, Vereen has proven to be a dynamic weapon for his offense. Freeman can have that same sort of impact, but might offer more as a ball carrier. Freeman could end up as a bell cow back, but more likely he will be a valuable part of a committee. He can catch the ball out of the backfield, and provide a big play here and there. If he adds some strength he could become a full time player. The opinions are extremely varied when it comes to Tre Mason. Some feel he is the best back in this class, while others believe he is massively overrated. The truth lies somewhere in the middle. Mason is a good stop and start runner who is very fluid. One thing that stands out with Mason is how wide he can make his strides while keeping his balance. His base control allows him to cover ground laterally with stunning quickness. He isn’t a powerful back, but could succeed behind a power man or zone blocking line. Doug Martin isn’t incredibly fast, but cover short spaces very quickly. Mason is very much the same type of player. Both guys keep their balance while changing directions, and run with fluidity. Martin and Mason are also solid in all phases, but masters of none. Each offers blocking scheme versatility, as well. At worst, Mason will end up being a nice complimentary runner. He can offer a change of pace to a 250 carry back. He could develop into more down the road. Mason’s biggest question revolves around how he will translate to a pro system, after playing in Auburn’s scheme. Those will have to be answered in the years to come. If you scouted just off the highlight tape, Lache Seastrunk would shoot up this list. He possesses a relentless cut, and his ability to change directions while maintaining speed is ridiculous. The Baylor star is smooth in the open field and can beat almost anyone to the edge. However, there are a number of flaws. Seastrunk isn’t decisive, and is an upright runner. At times he even looks like a wide receiver running in the open field—which can be a positive or negative. Seastrunk is also extremely behind both as a pass blocker, and as a receiver. Though he has the skills for performing the latter effectively, he just hasn’t been asked much. The former Steelers’ great won with exceptional speed and agility in the open field, and Seastrunk can do the same. However, Parker developed a more advanced repertoire as his career went on. Seastrunk has a lot of catching up to do with Parker, but he could end up being a similar player if it all breaks right. The safest bet would be that Seastrunk only ever becomes an occasional flash player. He will show up on Sports Center a few times, but won’t be a big factor as a regular contributor. The upside, and movement skills he presents are tempting enough for a team to try and harness his ability. It’s a gamble, but a worthwhile one. If he becomes a full time player, he will be a dangerous threat every time he touches the ball. You’ll normally find Bishop Sankey amongst evaluator’s top two running backs. Not here. Sankey is an instinctive runner. He is very aware of the space around him and where he should go. As his 4.49 forty time suggests, he is very explosive going in a straight line. He is not, however, laterally explosive in the slightest, and really struggles to turn the corner. Sankey is the type of runner who takes advantage of good blocking, but doesn’t create anything. He’s solid in all phases, but doesn’t offer any special or unique abilities. Sankey gets tackled on first contact far too often. Coming out of Georgia, Knowshon Moreno was touted for his versatility and explosiveness. These days he is an average runner, who can excel in a favorable setting, but isn’t a foundation piece. Both players have average physical tools, and do not create opportunities on their own. They don’t break a lot of tackles and their teams will always desire an upgrade. Though Moreno and Sankey are reliable, and sound in the passing and blocking game. Much like Moreno, Sankey will be more of a finishing touch to a great offense, than someone you build around. Ideally, he will be a secondary option in a power scheme with a fullback opening lanes for him. You could get away with Sankey as your starter, but he will leave you wanting more. The first thing that jumps off the tape with David Fluellen is his intelligence. He has strong awareness, especially with how his blocks will develop down field. He lacks great speed or athleticism, but still hits big plays because he anticipates openings. Fluellen’s frame is a little weird. He has a big upper body and square shoulders. He would be wise to either add bulk to his legs, or improve his pad level. Fluellen isn’t a sudden mover, but finds ways to elude tacklers. He is a very solid player, and would be a nice complimentary back. When the Colts drafted Vick Ballard, they never intended him to end up the starter. Nevertheless, that is exactly what happened in his rookie season. Ballard is not great, but he was a decently productive starter. In the same vein, Fluellen can sustain a running game, and keep a defense honest. He wouldn’t embarrass you as a starter. Long term, it would be best if he were a second option. 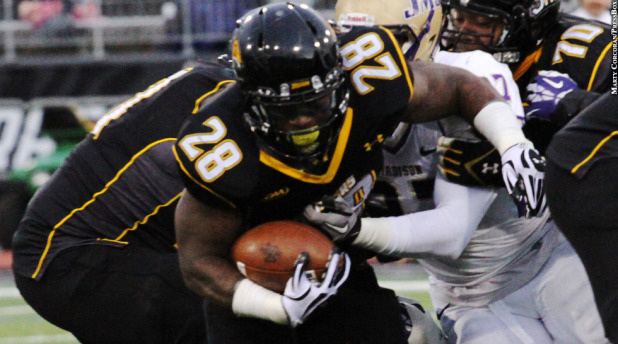 David Fluellen is the type of running back that not many know about, but will carve out a solid career. He’ll have some years where he is forced into extensive action, and he will be fine. While others he will be a clean up, part time player. His ceiling might be low, but his floor isn’t far behind.